Situated in the breadbasket of America, Nebraska’s location is key to its economy. Agriculture is the backbone industry, while the state’s central location in the United States is contributing to rapid growth in the areas of transportation and logistics. Skilled workers are needed to fill jobs at farms, farming support businesses, and transportation companies, and to support the state’s growing high-tech sectors. Completing a comprehensive training program at a vocational or trade school in Nebraska can open the door to jobs within these major industries. This guide provides information about accredited vocational and trade schools, career opportunities for graduates, and resources for workers. Students interested in Nebraska vocational and trade school can find great options that provide the training necessary to enter fast-growing professions. Some of the best jobs for graduates from Nebraska's various community and career colleges can be found in the construction and agriculture industries, both of which are booming in the state. To narrow down the potential schools, our list of rankings looks at points that matter, such as tuition and financial aid. All schools are accredited and offer placement services for grads. Accredited by the Higher Learning Commission, Metropolitan Community College provides two-year degrees in construction education, applied technology and health and public services. A team of enrollment specialists assist students with course scheduling and degree planning. The school was founded in 1974 and teaches classes at three campuses. The college also has an Applied Technology Center, the Sarpy Center and the Fremont Area Center where a nursing lab, classrooms and computer labs are housed. Applications are accepted online and in person. Students interested in transferring to a four-year school to complete their Bachelor's degree can participate in the college's Passport Program. A maximum of 50 students are accepted into the program each year. Western Nebraska Community College's three campuses are located in Alliance, Scottsbluff and Sidney. Pre-vocational programs provide the basics covered in specialized degrees. Pre programs that lead to degrees at Western Nebraska Community College include agricultural science, athletic training, chiropractic medicine, wildlife management and physical therapy. Four semesters of training are generally needed to graduate with an associate degree. Courses that associate degrees are conferred in prepare adults to work in nursing, the automotive industry, computer technology and healthcare. There are more than 28 student organizations, sports and online resources at the college. Classes at Southeast Community College are designed in eight career clusters. Making up the career clusters are health sciences, construction and electronics, communications and information technology, arts and sciences, business, community services and resources and agriculture, food and natural resources. More than 16 Associate of Applied Science degrees are conferred. It's also possible to get a diploma or certificate in vocations like welding technology and diversified manufacturing. Adults learn in the classroom and in accredited testing facilities. Class schedules for credit courses are posted online. The college's three campuses, located in Lincoln, Beatrice and Milford, operate on a quarter hour basis. Associate degree programs at Central Community College prepare adults to enhance existing careers or to enter a new career field. There are more than 30 customized two year degree training programs taught at the college. Agricultural sciences, technology, welding, culinary arts, healthcare, landscape design and construction and media arts are expertise areas that adults can major in. Depending on the degree, classes could be taught at only one of the school's three campuses. Adults wishing to complete a bachelor's degree at a four-year school in Nebraska can work with the school's academic transfer specialists. Columbus, Grand Island and Hastings are campuses where the academic transfer specialists have offices. More than 12 associate vocational degrees are offered at Northeast Community College. Utility line, veterinary technology, personal training, nursing, auto body repair, diesel technology and culinary arts are among the degree majors. Post graduation, students could work at independent body shops, restaurants, hotels, hospitals and for manufacturing firms. Up to 1,000 hours of lab work is required in programs like heating, ventilation and air conditioning. The Norfolk campus in is Northeast Community College's main campus. The college's other three locations are extended campuses in O'Neil, West Point and South Sioux City, Nebraska. Early entry college courses are taught to eligible high school students at the Ainsworth and Hartington regional offices. A student who enrolls in one of Nebraska College of Technical Agriculture’s vocational programs will find that the classes they attend will focus almost entirely on the field they are interested in. NCTA has designed many of these programs to be highly field specific, allowing students to work through their program without taking too many classes that they aren’t interested in. Transfer credits from another university may be able to fulfill certain degree requirements at NCTA, and the staff at admissions and records is more than happy to help with transcript evaluations. Community colleges, career training centers, and trade schools throughout Nebraska all offer vocational and trade education. Many include internship and apprenticeship opportunities so that students can get the hands-on training they need to take on specialized jobs. The state is committed to educating its workforce, and supports career and technical education (CTE) program enrollment as early as high school. Several high schools around Nebraska offer vocational programs where students concentrate their studies on CTE classes, with statistics showing that those who participate in CTE courses are 7.5 times more likely to stay in school. 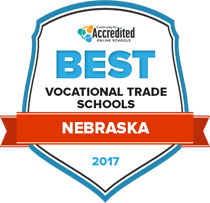 Use the search tool below to find accredited vocational and trade schools in Nebraska that meet your needs. Over the last five years, Nebraska students have consistently outperformed the national average in technical skills attainment. In the 2010-2011 school year, a third of high school seniors in Nebraska took at least three CTE courses, and two-thirds of seniors took at least one. 99 percent of students who take at least three CTE courses in a particular area meet academic requirements for graduation. Vocational students can earn a certificate, diploma, or associate degree from several schools in Nebraska. Secondary students can pursue options through the state’s comprehensive high schools, while a statewide community college system serves those at the post-secondary level. The state’s Partnerships for Innovation program brings together educators at both levels to provide vocational education aimed at fulfilling the state’s economic needs. While some Nebraska students choose a certificate or diploma program requiring one year or less, most opt for education at the associate or bachelor’s levels. The distribution of undergraduate certificates and degrees in Nebraska compared to national percentages is listed below. According to the National Skills Coalition, a group dedicated to improving worker skills, only 48 percent of Nebraska’s workforce in 2012 was trained to fill middle-skill jobs—those that require more than a high school diploma but not a four-year degree—although those jobs accounted for 58 percent of the total labor market. While that demand is expected to shrink slightly by 2022—to 51 percent—there is still a strong need for middle-skill workers in Nebraska. Jobs for these workers will likely be created in high-growth areas such as agriculture, transportation, biosciences, finance, and software development, industries that require workers with specialized skills often acquired through vocational and trade education. The table below lists careers with the most job openings in Nebraska along with salary information. There are several specialized career training centers available in Omaha, Nebraska’s largest city. Future healthcare workers may pursue an education through the CHI Health School of Radiologic Technology or the massage and healthcare training center at Herzing University. Those interested in beauty schools can attend the Capitol School of Hairstyling and Esthetics or Xenon Academy. Several community colleges offer vocational programs for skilled trade workers and aspiring business professionals. Metropolitan Community College is a public college with two campuses in Omaha that offer numerous associate degree programs. Vatterott College is a private school with programs in fields such as business, healthcare, dentistry, and various trades such as plumbing, electrical, and HVAC repair. Vocational and trade school graduates can explore opportunities at several major employers in the Omaha metro area. Healthcare is one of the largest industries, anchored by systems such as the Methodist Health System and the University of Nebraska Medical Center. The state’s agricultural industry has made Tyson Foods and ConAgra Foods strong presences in Omaha. First Data and PayPal are large employers offering data processing services, opening up opportunities for vocational grads in computer science and information technology. Virtual industry tours for students interested in pursuing vocational and skilled trades careers. Includes interviews with working professionals, work requirements for different positions, and information about salary and job prospects. For students and parents interested in exploring CTE programs in Nebraska. Provides tools for planning life after high school, creating a portfolio for the job search, and resources for connecting with employers. Provides information about the economy in Nebraska, housing and community updates, and resources for businesses. Comprehensive guide to career and education programs in the state, education standards, and student organizations. Provides information on the state’s employment trends and offers resources for both businesses and individuals.